Happy Hump Day my friends. Can you believe that tomorrow is the first official day of fall? I have finally accepted the fact that I wont be wearing a bathing suit for a while, and am now excited to break out my leather jackets, cozy sweaters, and drink pumpkin spice lattes. 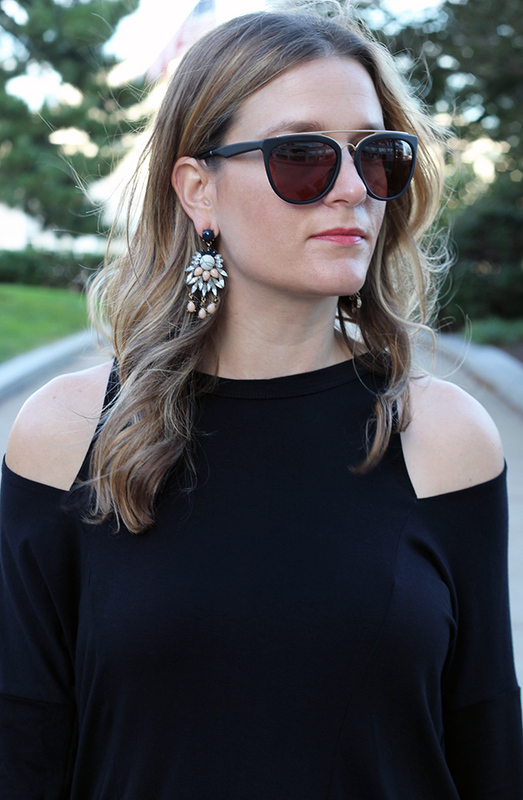 Today I am sharing two fall looks with the rest of the items that were in this month's Stitch Fix shipment. If your unfamiliar with the clothing subscription service, you can read all about it in my last post, here, along with seeing the other items that were in this month's box. The items that I'm sharing today are the Lavender Brown V Neck Dress, Edyson Faux Leather Drape Jacket, Edyson Burgundy Corduroy Jeans, and LNA Cold Shoulder Top. I mean, does this top not scream me? Although, I have to admit that I'm not a huge fan of wearing corduroys (although I did like the fit), and didn't love the dress, I was very happy with the rest of the items in my box. So far my Stitch Fix shipments have been spot on with my style. I know some people haven't been as lucky with their boxes, including a couple of my friends, and it got me thinking about what I am doing to get such great fixes. I came up with one simple reason: my blog. My stylist has an endless resource of photos to my style that helps her pick out items that will best fit me. Now, I know not everyone has a blog to share with their stylist, but here are some things you should be doing in order to get those boxes that you love each shipment. 1. Make sure to leave feedback. After you have tried on your clothes and are ready to check out, make sure that you fill out the feedback information on the Stitch Fix site. Describing what you liked or didn't like about each item from the style, to fit, and price, will help your stylist better chose those perfect items for the next fix. I also like to leave additional, more detailed, information in the comment section for my stylist. Information such as a different color would have worked better, I own too many boyfriends jeans, but would like to try this style instead, or I found this dress to be to short for my comfort level, are all things that I like to make sure my stylist knows. 2. Send notes to your stylist. On top of leaving feedback for the items you liked or didn't like in your last shipment, let your stylist know what you are looking for in the future. When you log into your account, there is a section where you can leave a note, letting your stylist know what you're looking for in your next fix. Whether you want a plaid shirt for the fall, have too many black tops, so you don't want that color, or that you have a wedding coming up next month and would love a formal dress, make sure to let your stylist know. The more detailed and specific you are about your style, the better your stylist can chose items that you'll love. 3. Update your style profile. As my style somewhat changes with each season, I like to go back into my style profile and make any necessary changes. For example, I love to wear boho looks in the summer, but in the fall and winter, my style tends to be more classic. Also, if your size and budget change, you want to make sure to update that information before your next fix. In your style profile, you can also add your social networks, which really helps your stylist get to know your style. Adding your Instagram account is a great way for your stylist to see photos of what you normally like to wear. However, if you don't want to make your Instagram public, then Pinterest is the way to go. We all pin looks that we love, so this will give your stylist a great reference. 4. Follow Stitch Fix's social networks. I know I just mentioned adding your social networks to your profile, but if you follow Stitch Fix on Instagram and Pinterest, and you see an outfit you like, you can then send that photo, or the item information to your stylist. Although they many not be able to get the exact item for you, they can then send something similar. Also, repining looks from Stitch Fix's Pinterest account to your own Pinterest board will give your stylist a good idea of what to send in your next box. It's a great idea to have a separate Pinterest board dedicated to Stitch Fix for your stylist to see. I hope this helps! You can try Stitch Fix for yourself by signing up here. * This post contains affiliate links. All thoughts and opinions are my own. Thank you for supporting the brands I love here at Threads for Thomas. I love the black jacket!!! Gorgeous clothes. I keep seeing people talk about stitch have fix. Your box was great! Happy Hump Day! Welcome by. <3 Ada. These pieces are all so gorgeous and congrats again on being featured by Stitchfix! I'm so tempted to try this out! Love that lace dress. Too gorgeous!! After seeing these pants on IG (I'm @ruthyannie) and finding out they were corduroy I had to come see them! They are seriously so fabulous! And that dress is so chic! The burgundy pants are awesome on you too - I though they were velvet, not corduroy at first! Perfect for cooler weather :) We don't have stitch fix here in Australia but I wish we did. You've got a great box! Hope you kept the velvet pants, it is so trendy in terms of color and texture for this Fall season! Great dress and the color of the pants is beautiful! Great tips! Everything you have shared from your boxes I have loved! These looks are no exception. Such a fun pair of pants, and I love the detail on the dress. Thanks for those tips! That's a lovely LBD btw!!! The cold shoulder top is great, and I love the color of the pants. Even if you aren't keeping them you should definitely keep looking for a pair in that shade, because they are gorgeous! LOVE it all!! That dress is absolutely gorgeous!! I may need it. The color of those cords is beautiful too! Great items! I'm loving that jacket and those corduroy pants! Great looks! These are really great tips! I love just love that black dress you got! My next fix arrives this weekend & you just made me extra excited for it! Have you tried Stitch Fix Men yet?